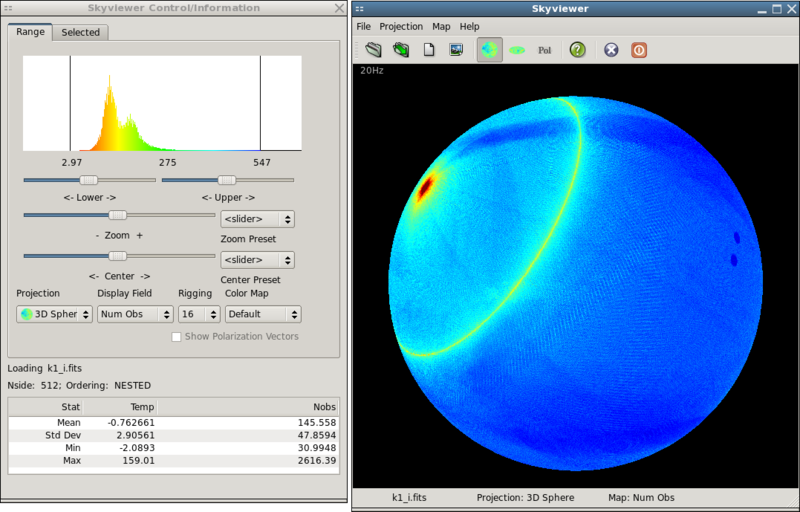 SkyViewer is an OpenGL based program to display HEALPix -based skymaps, saved in FITS format files. The loaded skymaps can be viewed either on a 3D sphere or as a Mollweide projection. In either case, realtime panning and zooming are supported, along with rotations for the 3D sphere view, assuming you have a strong enough graphics card. The program was developed and tested in a Red Hat Linux environment, but it should also build under Windows and Max OSX. Fullscreen WMAP Nobs map for K1 (313KB). HEALPix v2.0.1. It has been built against 3.1.1. The versions described above indicate the versions used to build skyviewer when that release was developed. 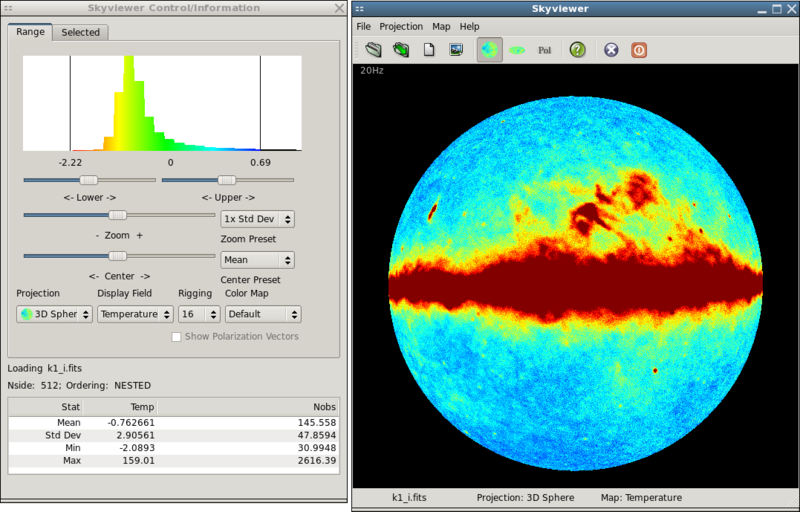 Note: SkyViewer does not require installation of the entire HEALPix package, just the C library. It should be sufficient to enter the directory /path/to/Healpix_1.20/src/C/subs/ and execute the commands make and make install. Version 1.0.1: skyviewer-1.0.1.tar.gz, skyviewer-1.0.1.zip, A Windows version has not been built as yet. 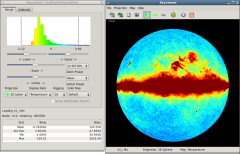 SkyViewer was developed on a Red Hat Enterprise Linux system. It has been successfully built under Microsoft Windows XP (an executable is provided for your convenience). It has also been successfully built under Mac OS 10.6 using the qt4-mac installation under Fink. Let us know if you have any success with other platforms. line from the top of this file. If everything goes as planned, you should have the binary skyViewer. Put it where you like to keep your binaries and enjoy looking at sky maps in full 3D glory. Please e-mail us with any comments, questions, successes, or failures: suggestions. The documentation is available in a TARBALL, in a ZIP file, and in HTML. It can be generated from source via Doxygen. Building it for the Mac OSX system is similar to the Unix installation. Be sure to include '-arch i386' in the compile commands when building cfitsio and HEALPix. Once the skyviewer Makefile is created, edit it to replace '-lQGLViewer' with '-framework QGLViewer'. The first step is to install the various required libraries. Then unpack skyviewer and follow the Unix build instructions. The program can be started with a FITS filename as an argument, which will be opened and displayed. Or if no filename is given, a File Dialog with open which can be used to select a file to view. Two windows will be present: the main Skyviewer window and a Control/Information window. The top menu of the Skyviewer window has a "Help" button that will provide information on how to use the mouse and keyboard to navigate the view. Also present are buttons for loading a new file, reloading the current file, saving an image file of the current view, changing the projection, help and exiting. The Control/Information window is used for adjusting how the skymap is displayed, displaying information of selected Healpix pixels and information for the loaded file. The Range tab on the Control/Information window is one of the main changes for this release. 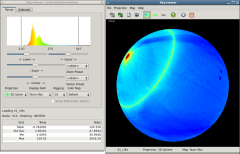 It controls how the selected skymap field is mapped to the selected Color Map. 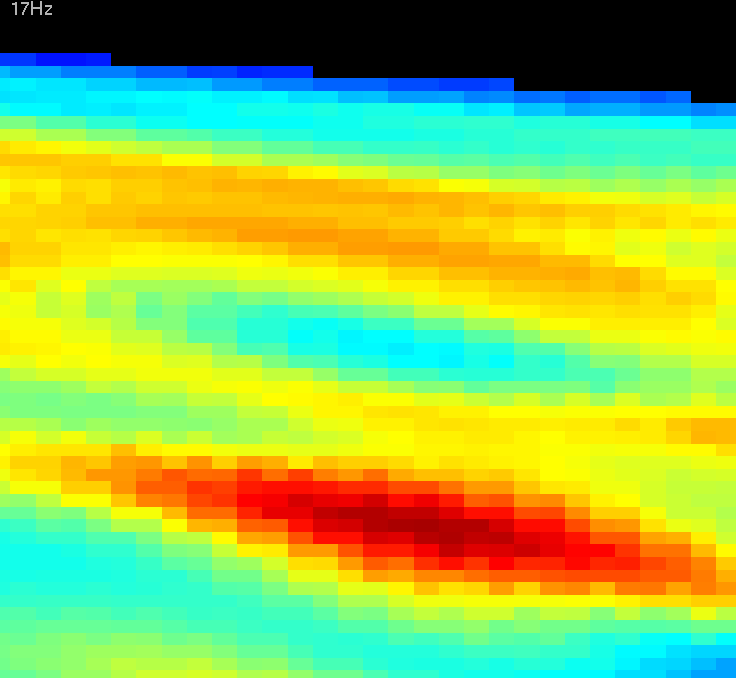 The top of the window shows a histogram of the values in the selected field, colored as they appear in the Skyview window. Vertical lines at either end of the window show the lower and upper limits of the current range. The current range can be changed via the "Lower", "Upper", "Zoom" and "Center" sliders. There are also presets for both the Zoom and Center, available via drop-down menus. The sliders work by pulling them away from their center positions. The further from the center they are pulled, the quicker the selected value changes. As soon as any slider is released, the value it controls stops changing. This way, both small and large value changes are readily made. From the Range tab, the projection, display field and color map can be selected. The fineness of the displayed sphere's polygon is controlled with the "Rigging" menu. The display of Polarization Vectors presently only works with the 3D Sphere projection. The Selected tab for the Control/Information window shows the pixel values for those pixels that have been selected in the Skyview window. To select a pixel in the Skyviewer window, use "Shift-Left click" on the mouse. The selected pixel will then be high-lighted and added to the list of pixels. "Shift-Left click" on a selected will remove it from the list. Also displayed on the Selected tab are common statistics for the list of selected pixels. When viewing the list of selected pixels, individual pixels can be selected with the mouse. This list has the usual "Shift-click" to select a range of values and "Ctrl-click" to add/remove from the selection set behavior. The selected entries in the list can then be removed from the list. To have the Skyviewer window center on one of the selected pixels,just "Double-Left-click"on the entry in the list of selected pixels. The list of selected pixel values can be saved to an ASCII file as multi-column list, with headers. Builds against libQGLViewer 2.5.1; this required adding an explicit reference to this library's manipulatedCameraFrame.h header file. Builds against HEALpix 3.1.1. This required adding mk_xy2pix from an earlier version (see above). Still have some edge details to get right for the Mollweide projection. Now that each image pixel is a HealPix pixel, The cursor location can now be mapped to the corresponding map pixel. This allows the selection of a pixel and then lists the information of the pixel. Currently, this only works while in the 3D Sphere mode. To use, "Shift" + "Left-Mouse-Button". Tie the views of multiple files together using one range selection widget and one camera. Please let us know what you think of this viewer, including suggestions for improvements and complaints over its interface and functionality.